Have you found an injured or orphaned bird of prey? Don’t miss the 2018 edition of Indiana Raptor Center’s annual Raptor Rendezvous! Pay online: Click the PayPal Button below. We really appreciate your shares on social media! Don’t miss this exciting chance to see beautiful birds of prey in person and help us help them. 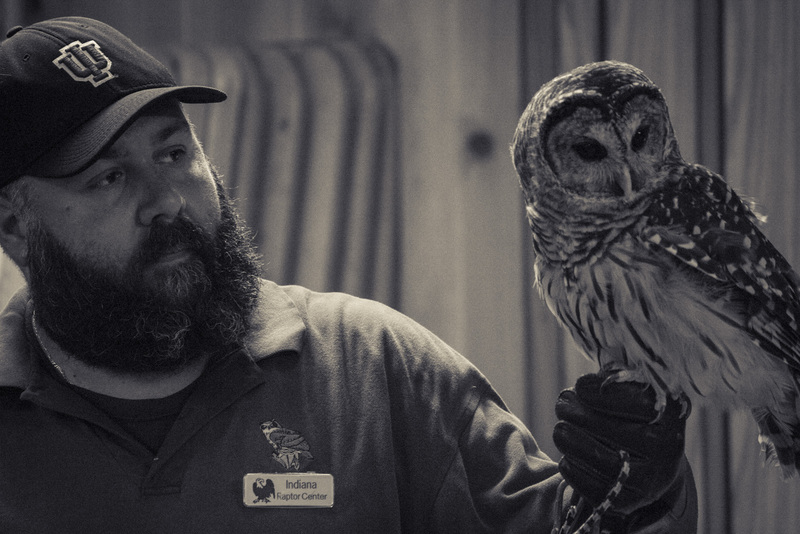 Domonic Potorti talks about Mowgli, a great horned owl, at Brown County State Park. The 2018 schedule of Indiana Raptor Center presentations at Brown County State Park has been finalized! This is a great opportunity to see four birds of prey at close range, take photos, and learn about their lives and their importance in the environment. Presentations on the following dates take place at 7:30pm at the Abe Martin Lodge. Our presentations are free to attend, but there is an admission fee at the park gate. Donations, which always go to supporting the rehabilitation of the magnificent birds in our care, are gratefully accepted! Indiana Raptor Center is happy to welcome the public to tour our Nashville, Indiana facilities. Tours are held from 3-4pm daily, by reservation only. You can make a tour reservation by calling us at 812-988-8990. Tours available March through July, September through November, and during December, weather permitting. Adult admission is $10; Children age 6-12 are $7 each. In order to ensure the safety of our resident birds of prey and visitors, no children under the age of 6, please. All ages are welcome at our frequent presentations at Brown County State Park’s Nature Center and Abe Martin Lodge, however! Please check back soon for our schedule of presentations for 2018 and be sure to follow us on Facebook, too! Due to a heavier than normal patient load for this time of year, the Indiana Raptor Center will be closed for tours after Thanksgiving. Patients will still be accepted as usual. We will reopen for tours in March of 2017. Since our tours are a totally outdoor experience, we are normally closed in January, February, and August every year due to weather concerns (snow, road conditions to get here, cold, and heat in August) and stress on the birds (heat in August, plus a needed break in their programming schedules). We will be open for tours from March thru July, and from September thru December, in 2017. Tours are available during these months in the afternoons from 1-5PM. Please contact us through this website (email or phone) for reservations. Offsite programs may continue to be arranged year-round at your school, museum, meeting place, or other venue. InRC board member Domonic Potorti and Elmo the Barred Owl educate the campers at Happy Hollow in Brown County, IN. It’s time once again to for Raptor Rendezvous, a chance to come together to celebrate the beauty of birds of prey! Besides the opportunity to see beautiful raptors and other wildlife, attendees will enjoy refreshments and bid on a wide variety of silent auction items. All proceeds from the event will go to support Indiana Raptor Center’s mission of caring for injured and orphaned birds of prey and educating the public about the value of these magnificent animals. Tickets are $30 per person. To purchase your ticket, please call 812-988-8990. Tickets are selling quickly and we only have a few left! Our friend Avery is our featured artist for July-August. Avery is a bright talented 8 year old Hoosier who is a good friend of the Indiana Raptor Center. Her artwork displays an observational power, and the budding skills to reproduce those observations, that are well beyond her years. Jack Wittenbrink, our supporting metal and papercut artist from New Orleans thinks she is something of a prodigy because her drawings depict correct anatomical features in proper proportion, while also putting the light of life, curiosity and spirit into the birds she draws. We are happy to have her as a friend, and will continue to feature her work on this website as long as she continues to grace us with more drawings! Barn owl with mouse, by young artist Avery.